The smell of baked cinnamon rolls wafting through the house is the ultimate in festive comfort at this time of year. Added cranberries and apricots give these a seasonal twist – the perfect thing to enjoy on a cold winters morning. 150ml hot milk and 150ml hot water mixed together – hot but not boiling! - Place the flour, cranberries, yeast, salt and caster sugar into a large bowl and stir together. Now add the hot milk and water and mix together using an electric mixer with a dough hook attachment for 5 minutes – if you don’t have an electric mixer that’s fine, you can just use your hands and mix and knead for about 10 minutes. Once the dough has been mixed and kneaded, cover the bowl with a tea towel and leave in a warm place for 1 ½ hours, or until the dough has doubled in size. - Once the dough has risen, turn it out onto a lightly floured surface and knead for another 5 minutes. Roll the dough out into a large rectangle about 1 cm thick, spread the surface with the melted butter and scatter over the sugar, cinnamon and apricot pieces in an even layer, making sure you reach the edges. 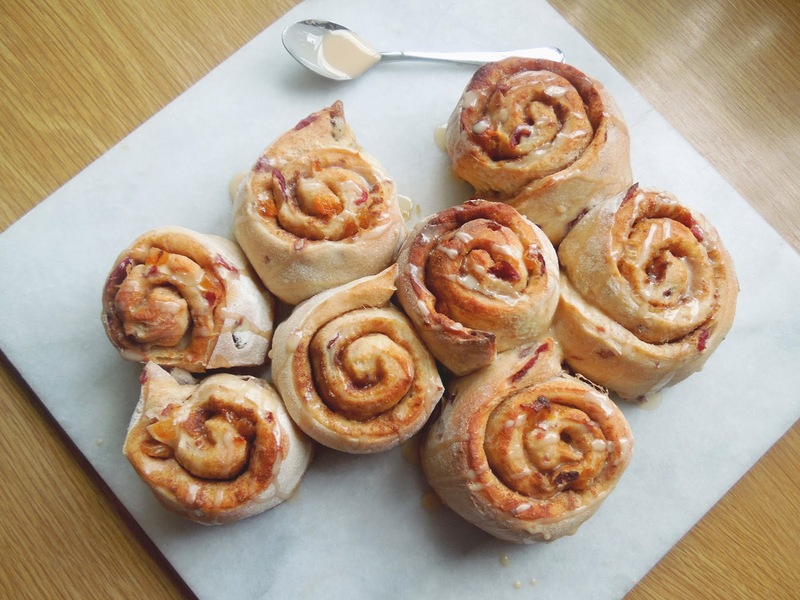 Now roll the dough into a tight sausage shape, slice into 8 even pieces and place these, swirl side up on a lightly oiled baking tray. - Leave in a warm place for a further 30 minutes, or if you want to make these for breakfast next day you can leave them in the fridge overnight (although if you do this, you will need to take the rolls out of the fridge and leave for 30 minutes to come up to room temperature before baking). - When you are ready to bake the rolls, preheat the oven to 180°C and bake for 13-15 minutes, or until the rolls are well risen and a lovely golden brown. Remove from the oven and leave to cool slightly. You can eat the rolls as they are, but for an extra delicious twist make up some icing using 3tbsp icing sugar, 1tbsp water and 1tsp vanilla extract and drizzle over the top of the hot rolls. Tear off and eat warm – heavenly!